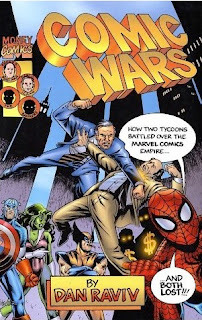 Comic Wars: How Two Tycoons Battled Over The Marvel Comics Empire — And Both Lost. Dan Raviv. Broadway Books. 320 pages. The business of comic books is a fascinating one, in many ways a microcosm of American industry. It all began in the early part of the last century as a means of using otherwise idle color presses. Its original "content" was compilations of previously published newspaper cartoons. But when these compilations sold well, a new industry quickly formed, and original material was required. With the success of its first genuine star, Superman (whose strip was a cut-and-paste job originally intended for newspaper syndication), the need for new strips exploded. Scores of new publishers seemed to appear overnight. Assembly-line principles produced thousands of pages of comics by editors, writers, pencil artists, ink embellishers and colorists in "bullpens" based mainly in New York City, the center of the American publishing industry. Fast forward. By the late '40s and early '50s, this once-thriving business hit on hard times. The number of publishers were down to a handful, decimated by wartime paper shortages, then a politically motivated attempt to tie comics to a rising youth crime rate — as if "juvenile delinquents" were avid readers! The growing popularity of television didn't help sales either. By the 1960s, most of the survivors sold out to larger corporations. And as consolidation continued, one of the largest remaining comics companies, Marvel, was a ripe target. "Ronald O. Perelman — America's richest short, bald, forty-six-year-old chain-cigar-chomper — seemed to have a delicious deal when he bought Marvel Entertainment Group in January 1989. This was not a hostile takeover. It was simply a matter of negotiating a fair price for a property that seemed to have untapped potential. The owner dumping Marvel was New World Entertainment, a Hollywood production company that garnered very limited payoffs from made-for-television movies featuring the Incredible Hulk and other Marvel comics superheroes. New World had gone flat and wanted to pump itself up with new genres of TV and movies. So Marvel was on the auction block, and when Perelman saw that half a dozen companies were making bids he hardly needed to check his credit line. He simply outbid the others at $82.5 million. The delicious part was what Wall Street calls leverage: He had to put up only a small percentage of the money. All the rest was somebody else's." It's an interesting account — up to a point. The problem is, the book is about deals. Raviv relishes the subject, but most of the, well, color of the comics business is essentially missing. The various wheelers and dealers (Ronald Perelman, Carl Icahn, Isaac Perlmutter and Avi Arad) are a bunch of rich guys playing with bonds, zero coupons and leverage: boring stuff irrespective of the specifics of the business. Raviv, a distinguished journalist whose distinctive — and breathless — reports for CBS Radio are always sharp, unfortunately fails to elicit much interest from the reader as he describes interminable exchanges of faxes, attorneys' letters, impromptu meetings and the like. Also absent is any real knowledge of comics on the part of the author. For example, not even journeyman artist Sal Buscema's mother would call him "one of the great Marvel artists" as Raviv apparently does. Similar errors appear throughout, but that's not the big problem with Comic Wars. Although a current Marvel exec recently confided that he's having a lot of fun with the book, the rest of us will have to look elsewhere for tales to astonish.